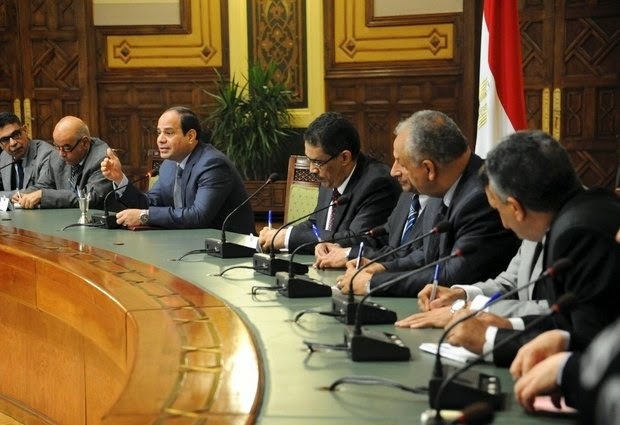 In this photo provided by Egypt's state news agency MENA, Egyptian President Abdel-Fattah el-Sissi, center, meets with editors of Egyptian newspapers and media in the presidential palace, in Cairo Egypt, Sunday, Aug. 24, 2014. El-Sissi denied Sunday any military involvement in neighboring Libya, a day after Islamist militias accused Cairo of bombing their posts in Tripoli, Egypt's state news agency reported. El-Sissi said Egypt is in consultation with Libya's neighbors to find a political solution to the violent power struggle between rival groups. CAIRO, EGYPT (ASSOCIATED PRESS) — Egypt's foreign minister has called for an international push to disband militias in neighboring Libya, where weeks of inter-militia fighting has wreaked havoc in the country. Sameh Shukri says the escalation of violence in oil-rich Libya poses a threat to the entire region. He is calling for a joint effort to disband all militias, "without exception." The Egyptian top diplomat spoke Monday at a Cairo gathering of Libya's neighbors. It was attended by Tunisia, Algeria, Sudan and Chad. The meeting comes as Islamist-led militias in the Libyan capital say they consolidated their hold on Tripoli and its international airport, driving out rivals to the city's outskirts after battles that largely destroyed the strategic hub. It's the worst violence in Libya since the 2011 downfall and killing of dictator Moammar Gadhafi.